If you’ve ever had the luxury of eating banana pancakes in Thailand, you’ll know just how delectable they are. These are a take on the pancakes I chose off the restaurant menus in Thailand time and time again. Light, fluffy and seriously moreish, they are sure to get you in the good books with whoever put you on the naughty chair (errm, sorry about that, honey). This recipe is perfect if you have a crowd to feed, as the pancakes keep well in a warm oven in between a couple of paper towels whilst you finish off rest of the batch. 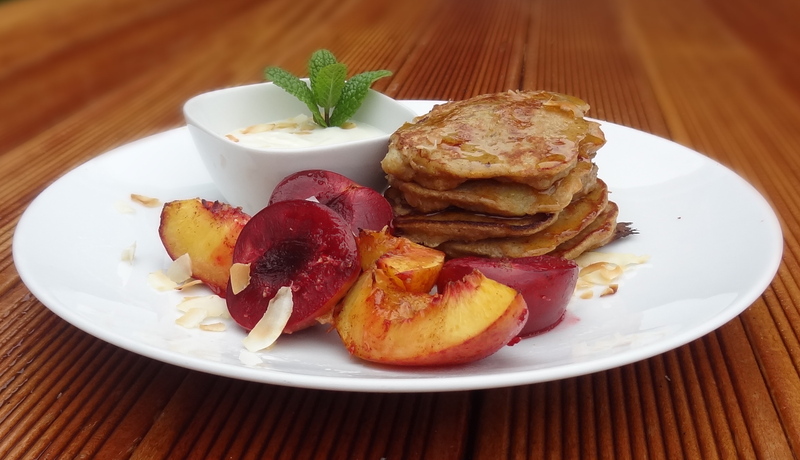 The combination of the pancakes with the roasted stone fruit and coconut yoghurt is such a winner that this is sure to become a Sunday morning staple. Coconut has received a great deal of press recently. as it is often hailed as a superfood but also has a high content of saturated fat, which is linked to heart disease. However, coconut also contains lauric acid, which is a super foodie star. Lauric acid may help raise good cholesterol levels and is antimicrobial, which supports the immune system. Coconut also contains vitamin C and potassium, which coupled with potassium-rich bananas in this recipe, is sure to pack a punch. My advice is to enjoy the benefits of coconut in moderation and head out for an afternoon stroll with your honey to further cement your place in their Good Books. Measure the dry ingredients into a bowl, mix together and form a well in the centre. Mash the bananas and put aside. Beat the eggs until nice and fluffy and add the coconut milk and vanilla. Add the bananas and then place all the wet ingredients in the well and mix until combined. Heat a small amount of coconut oil in a pan and spoon the batter into the pan. N.b. these pancakes tend to flip better if they are smaller, usually 3 in the pan at once works a treat. Cook until the upper side is covered with bubbles. Turn the pancakes and cook the other side until golden brown. Place on a plate in between two paper towels and rest in a warm oven. Repeat with the rest of the batter until you have a mound of delicious pancakes. Heat the oven to 180°C. Cut the stone fruit into halves or quarters depending on size and place in an oven dish. Mix the syrup/agave with the vanilla and lemon zest and drizzle over the fruit. Bake in the oven for 20 – 30 minutes until perfectly roasted. Mix all of the ingredients together and put in small ramekins. To serve: Stack the pancakes on a plate, add a good serve of roasted fruit and arrange the ramekin of coconut yoghurt so that it looks pretty. Garnish with toasted coconut flakes and a fresh sprig of mint from the garden. Drizzle apple syrup or maple syrup over pancakes and devour. Serves 2, with leftovers for snacking on later (if you’re lucky).